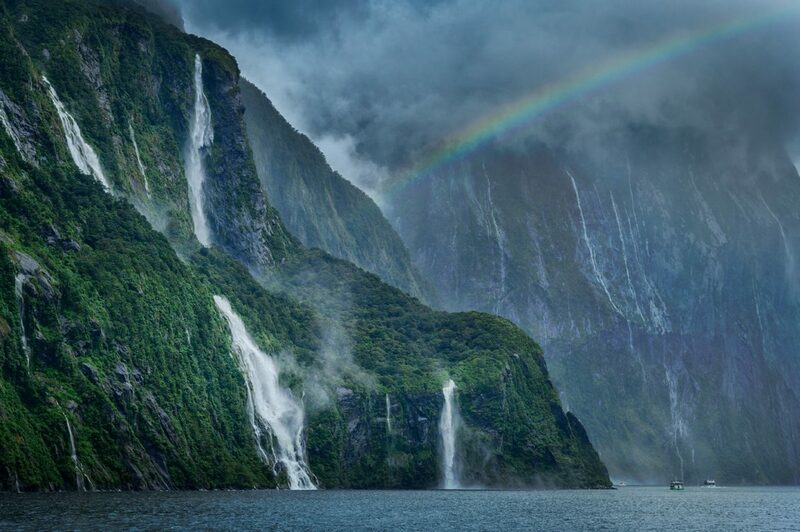 New Zealand has been a favorite destination for nature lovers and landscape photographers for decades. The natural beauty of this country is unsurpassed. 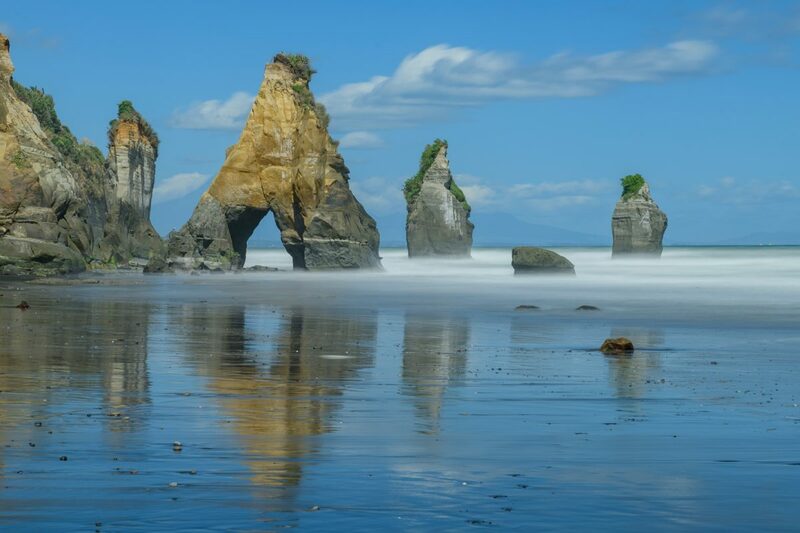 From stunning sea stack studded seascapes to high mountain peaks surrounded by lush temperate rain forests and glacier fed rivers and lakes in the southern alps. We will explore the vast hidden treasures, from the stunning seascapes of the western Paparoa Coast to the volcanoes on the North Island. This photography adventure of a lifetime in the far reaches of the South Pacific is lead by veteran New Zealand traveler and photographer Christian Heeb and renowned photographer and workshop leader David Cobb. Christian has photographed in New Zealand for over 25 years and knows the country intimately. 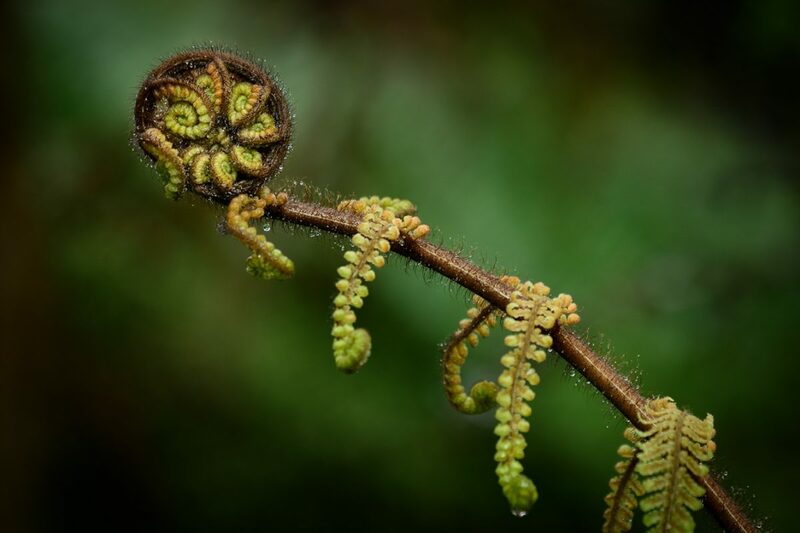 Get inspired by images from our last Photo Tour to New Zealand. 6 - 13 persons, with 2 Photographer leaders in 2 cars. February 27 : Arrive at Christchurch Airport. (CHC) Overnight in Christchurch. February 28 : Getting acclimated to New Zealand with a short drive to Banks Peninsula. Overnight in Akaroa. March 1 : Heading south along the coast to Omaru and the Moreaki Boulders. 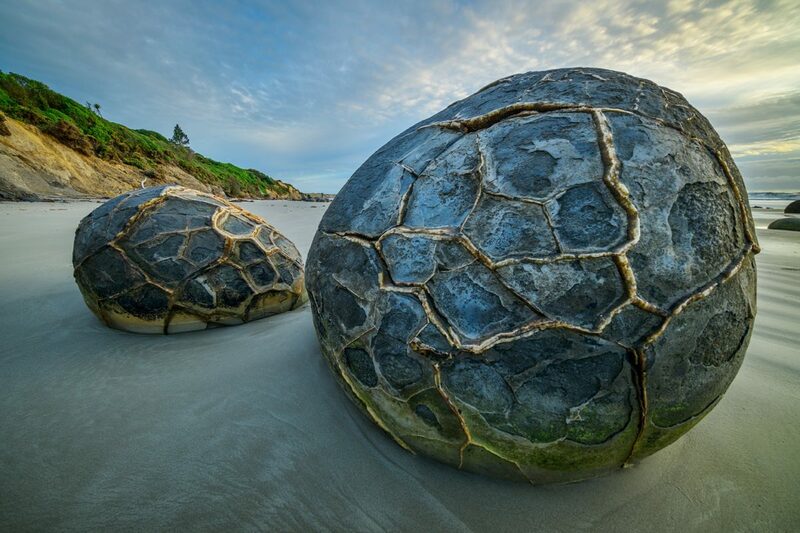 The Moeraki Boulders are unusually large and spherical boulders lying along a stretch of Koekohe Beach. Overnight near Omaru. March 02 : Dunedin Otago Peninsula. We head even further south and explore the sea cliffs along its coast at Tunnel beach. Overnight in Dunedin. March 3 : Today we head across the Otago plains to the Southern Alps the Fiordland town of Te Anau. Photography along its lakes and moors. Overnight in Te Anau. March 4 : Drive to Milford Sound where we explore this stunning landscape and overnight in the Park. March 5 : Another day of exploring the park then drive and photography in Wanaka. Overnight in Wanaka. 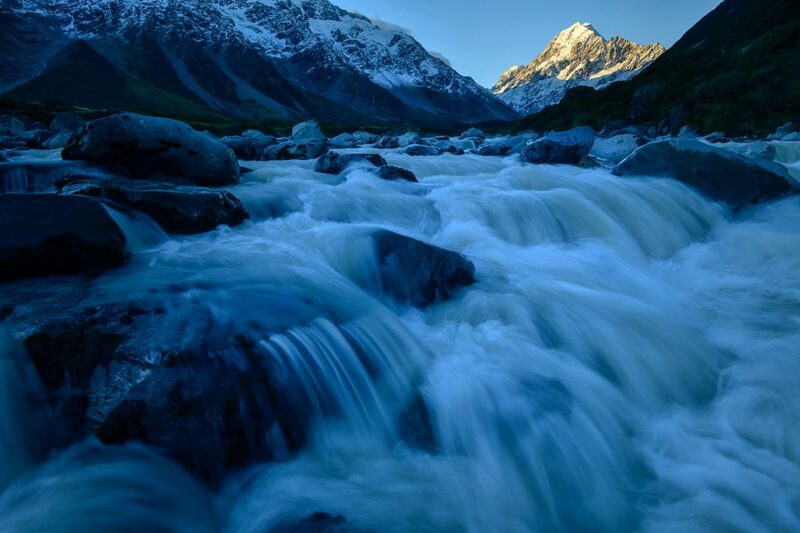 March 6 : After a sunrise at the lake we head to New Zealand's highest Peak Mount Cook in the National Park with the same name. Overnight at Mount Cook. March 7 : Another day spent photographing in Mount Cook National Park. March 8 : After a sunrise photo session drive back to Wanaka were we have another go at the famous Wanaka tree and the beautiful lakeside. Overnight in Wanaka. March 9 : After a hopefully stunning sunrise we head out early and drive along the beautiful lakes Pukaki and Hawea over the Alps to New Zealand's rugged West Coast. 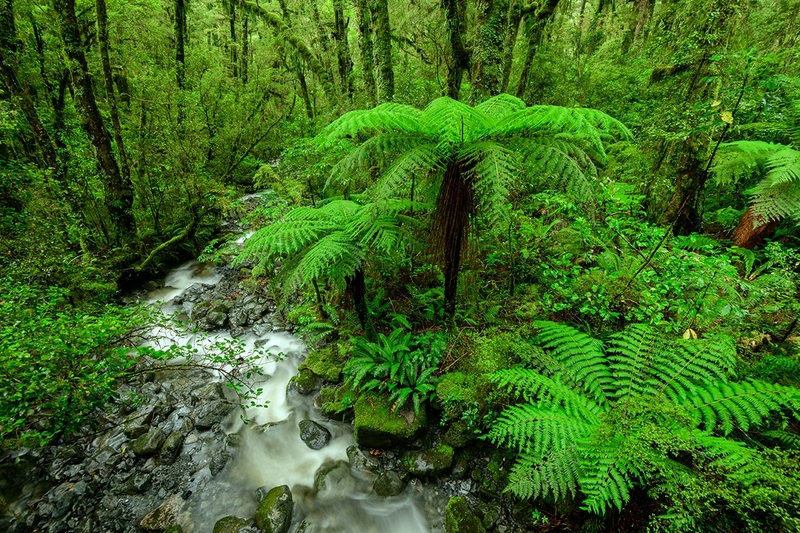 The dry arid high plateau gives way to the lush and green of the Paparoa Coast. 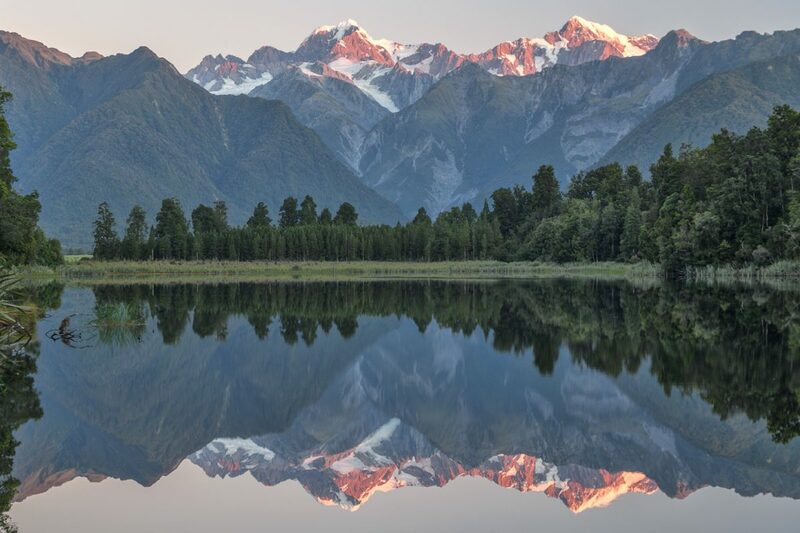 Visit Lake Matheson. Overnight at the town of Fox Glacier. March 10 : Drive along the spectacular West Coast to the town of Westport. March 11 : After a sunrise session along the coast drive over the mountains to Abel Tasman NP and the Golden Bay. Overnight in Takaka. 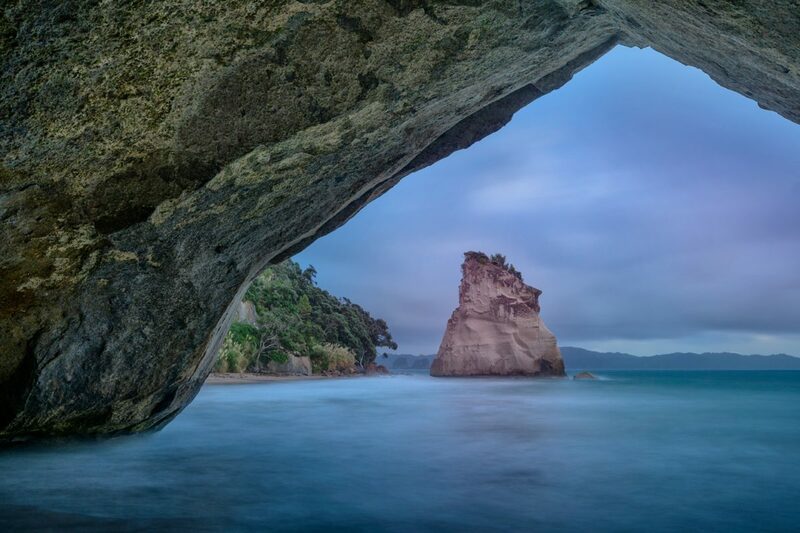 March 12 : Visit and photographing the famed sea cliffs and arches at Wharariki Beach. Overnight in Takaka. 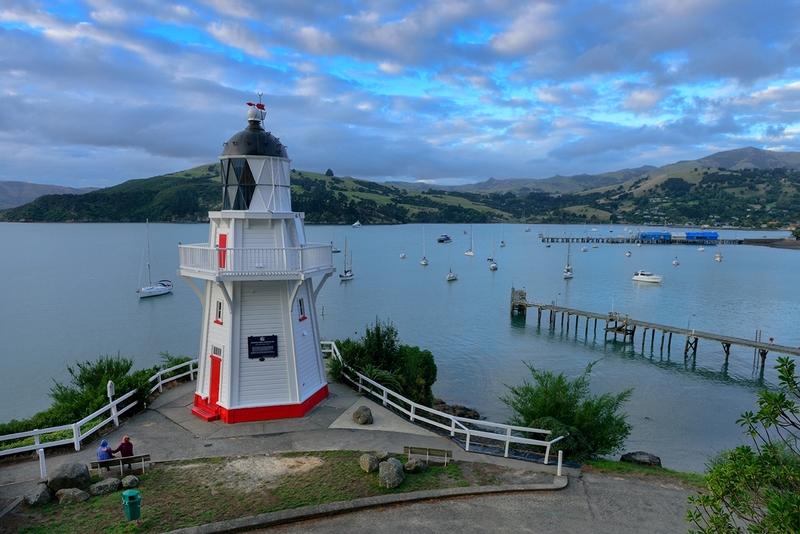 March 13 : Leave Takaka and take the ferry from Picton to Wellington on the North Island. Overnight in Lower Hut. March 14 : We are heading North to the White Cliffs near Plymouth and Mount Taranaki. Photography at Lake Mangamohoe. Overnight New Plymouth. March 15 : Drive to Tongariro National Park where we have the option do do a little hiking and photograph waterfalls and Volcano views. March 16 : Leave the volcanoes and head to the town of Taupo. Visit Huka Falls. Overnight in Taupo. March 17 : Sunrise at Craters of the moon geothermal area. We travel to nearby Rotorua. Weather depending we visit various thermal areas or stunning rain forest scenes. Overnight in Rotorua. March 18 : We follow the coast north to the famous Coromandel Peninsula. We will explore the coastal area with its coves and Rock Arches. Overnight near Whitianga. March 19 : Another full day on Coromandel. Overnight near Whitianga. March 20 :Head back to Auckland. Photograph Skyline. Overnight near Auckland Airport (AKL). March 21 : Individual flight home or fly to Australia for Southern Australia & Tasmania Photo Tour.